For the fictional religion in the Marvel Universe, see Church of Humanity (comics). For the fictional religion in the Honorverse, see Church of Humanity Unchained. 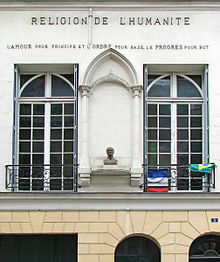 Church of Humanity was a positivist church in England influenced and inspired by Auguste Comte's religion of humanity in France. It also had a branch or variant in New York City. Richard Congreve of the London Positivist Society was important to the founding of the English church in 1878. Despite being relatively small the church had several notable members and ex-members. For example, Anna Haycraft was raised in the "Church of Humanity" before converting to Catholicism. The New York City version originates with English immigrant Henry Edger. In 1854 he decided to dedicate himself to the "positive faith", but actual organization of the movement did not come for another decade. In 1869 an organization formed with David Goodman Croly as a leading member. Croly strongly believed in the religious element of Comtism, but was somewhat limited in evangelizing for it. By the 1870s the positivist organization led to an American version of the "Church of Humanity." This was largely modeled on the English church. Like the English version it wasn't atheistic and had sermons and sacramental rites. At times the services included readings from conventional religious works like the Book of Isaiah. It was not as significant as the church in England, but did include several educated people unrelated to Croly. Nevertheless, one of the most noted people raised and baptized in the New York "Church of Humanity" was David Croly's son Herbert Croly. Religion of Humanity - In France and Brazil, possibly more directly from Comte.